A sequel to Bad Dog Flash, this picture book is a wonderful exploration of the tension between having agency and being subject to, a conflict that all young children experience. I am sure my dog Millie experiences the same dilemma as she struggles with the boundaries that I give (though, lucky for her there are no fences, compared to the joy of wandering the neighbourhood with a tennis ball in her mouth). This is Flash’s world. The opening page shows Flash with a dog-belt in her mouth and the excitement of the possibility of adventure. She rolls and she squiggles. Out though the cat flap and…Oh no! “Go home, Flash” says Dad, as he heads off to work. 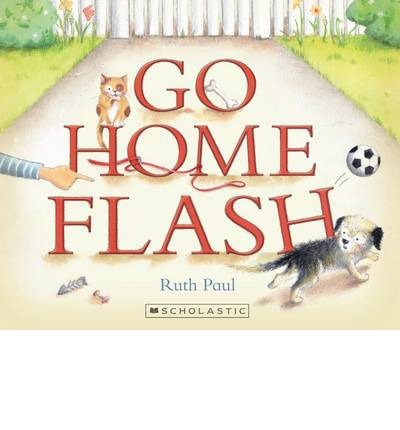 But Flash is determined, jumps the fence and…”Go home, Flash,” says Dad as he waits by the bus stop. There are many attempts at saying notice me and play with me, but Flash is rejected. How does the family react to the possibility of Flash being missing? Where is Flash? Well, if the real is not possible, there is the imagination! The blend between words and pictures here truly works: simple sentences are joined with illustrations that give detail to extend the sentences with an illustrative style and soft palette that is evocative. The book is a pleasure for all children who have a pet dog (or children who would love one).